1. What should I do if the flight controller doesn’t connect to DJI Assistant 2? a. Make sure that the drivers and DJI Assistant 2 are correctly installed. c. Make sure the flight controller is powered on. d. Try other USB ports or other USB cables. 2. What should I do if there is no response from the motors when I pull the control sticks? a. Make sure you are pulling the control sticks correctly. b. Check the status of the flight controller in DJI Assistant 2. If there’s an abnormality, repair the aircraft according to the instructions on the screen. c. Check that the entire travel of the control stick is mapped to its corresponding channel in the correct directions. d. Check if the ESC is working properly and that it is compatible with your flight controller. e. Check if the remote controller system is linked. 3. What should I do if the aircraft flips over after taking off? a. Check if the orientation of the flight controller is correct. b. Check if the orientation of IMU is consistent with the directions set in the DJI Assistant software. c. Check the rotation direction of the motors and propellers. d. Check if the ESCs are connected to the correct ports. e. Check if the mixer type is correctly set in the software. f. Calibrate the ESC throttle range (if using a third-party ESC). 4. What should I do when the aircraft’s attitude starts to drift mid-flight? a. Check if the aircraft’s center of gravity is well balanced. b. 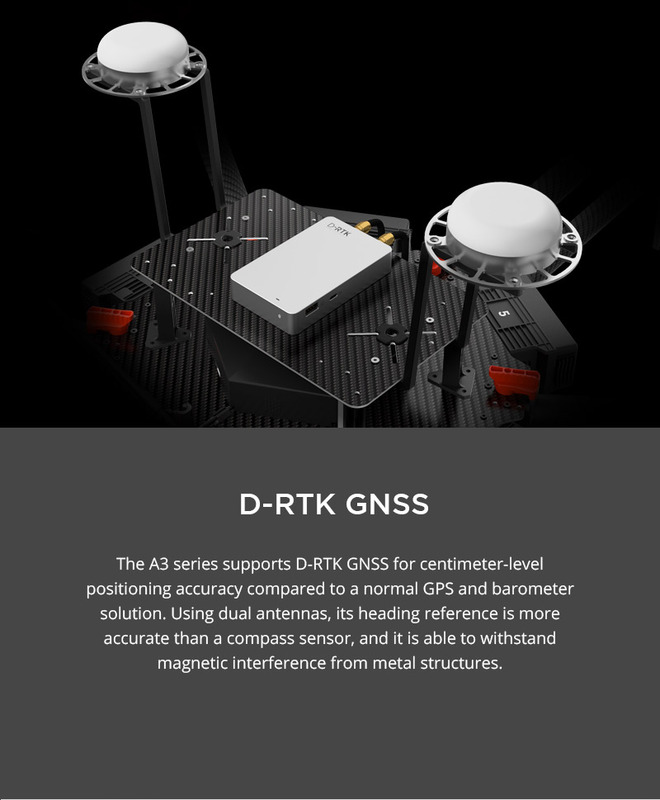 Check if the GPS’s center of gravity is properly set in the DJI Assistant software. c. Check if the propellers are level. 5. What should I do if DJI Assistant 2 fails to shut down when the Micro SD card is locked in Read mode? 6. What should I do if a switch fails to function after calibrating the remote controller? Re-calibrate the remote controller by centering all the tap positions in the DJI Assistant app. Failure to do so will prevent certain channels from functioning properly after calibration. 7. What are the functions of the P, A, F, and M modes in DJI Assistant? P-mode (Positioning): The GPS and Vision Positioning System is used for precise positioning in this mode. A-mode (Attitude): The GPS and Vision Positioning System is not used for holding position. The aircraft only uses its barometer to maintain altitude. 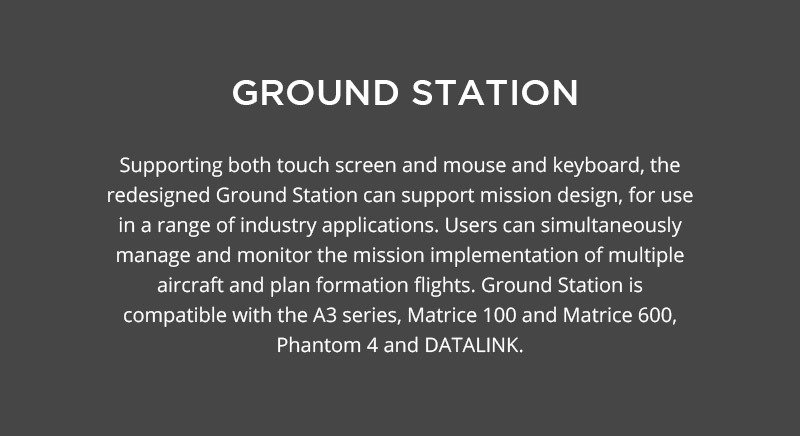 If it is still receiving a GPS signal, the aircraft can automatically return home if the Remote Controller signal is lost and if the Home Point has been recorded successfully. F-mode (Function): Intelligent Orientation Control is activated in the mode. M-mode (Manual): The GPS and Vision Positioning System are not used for holding position and no barometer is used to maintain altitude. Only use this mode in an emergency. 8. What should I do if I can’t install the DJI Assistant software on my Windows 7 computer? a. If your operating system is Windows 7, you need to download the usbser.sys file, place it under C:\WINDOWS\system32\drivers, and then reinstall the driver. b. Click here (http://download.dji-innovations.com/downloads/driver/usbser-cn.zip)to download the usbser.sys file. 9. What should I do if “DJI Assistant 2 already running!” is prompted when DJI Assistant unexpectedly closes and restarts? Kill the Root.exe process and then restart DJI Assistant 2. 10. What should I do if the LED turns red after the firmware is successfully updated? The flight controller will be locked after upgrading the firmware as the parameters are reset. 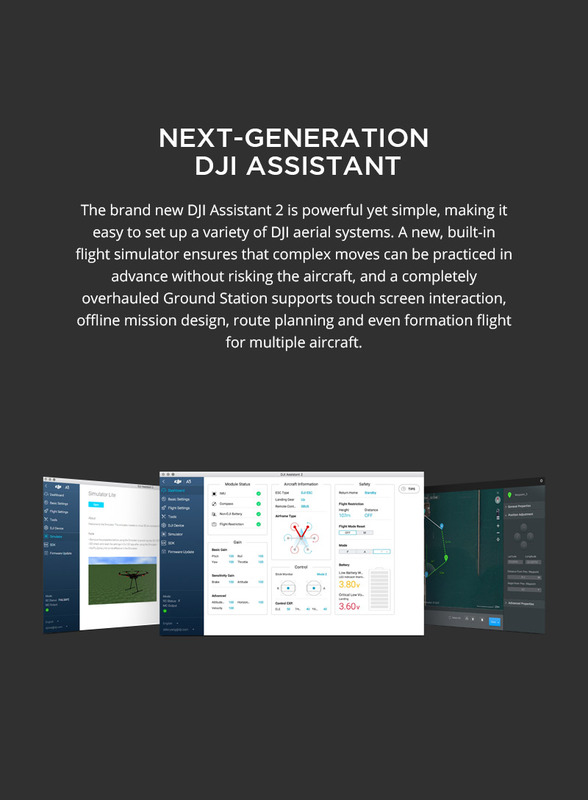 You can unlock it the flight controller in DJI Assistant 2 and reset the parameters. 1. What ESCs are the A3 flight controller compatible with? The A3 series is compatible with standard 400Hz ESCs on the market with 1520US center points. 2. Do I have to disconnect the red cable on a third party ESC to the A3? If the ESC supports BED, then the red cable should be disconnected. 3. Where should I install the IMU module and what is the distance range from the center of gravity? It should be installed near the center of gravity. Please keep it away from other electronic devices, such as the GPS module, receiver, ESC, etc. 4. Are the CAN1 and CAN2 ports interchangeable? No, the CAN1 port supports the A3 module and other DJI equipment whereas the CAN2 port supports SDK equipment. 5. Does the A3 flight controller support the Lightbridge HD video downlink or other similar video downlink equipment? 6. Does the A3 flight controller support iOSD data storage? The iOSD storage device is built into the A3 flight controller and the iOSD parameters can be displayed when used with the Lightbridge 2. 7. How do I use the Intelligent Flight Modes on the A3? 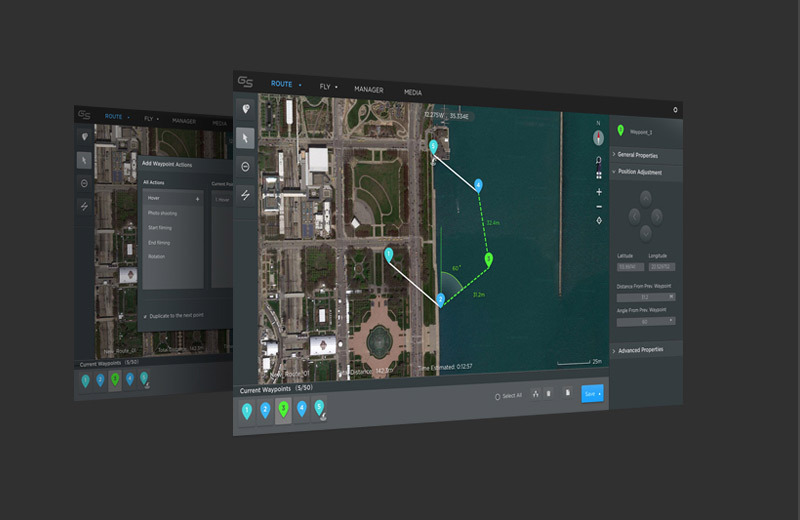 Course Lock, Home Lock, Point of Interest and Waypoints are available when using the A3 with Lightbridge 2 and the DJI GO app. 8. Does the simulator support third-party remote devices? It supports third-party S-Bus remote devices. 9. Is the PPM receiver compatible with the A3 flight controller? 10. 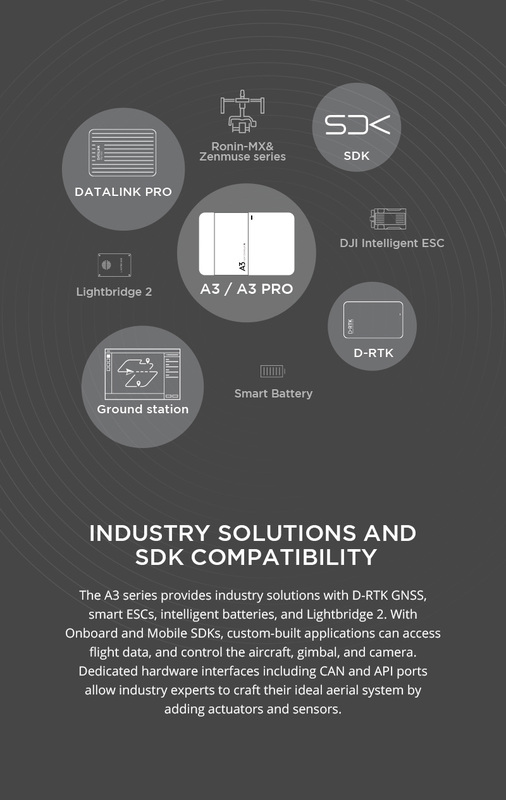 Does the A3 flight controller support third-party remote controllers to control the gimbal system when used with the Lightbridge 2? 11. 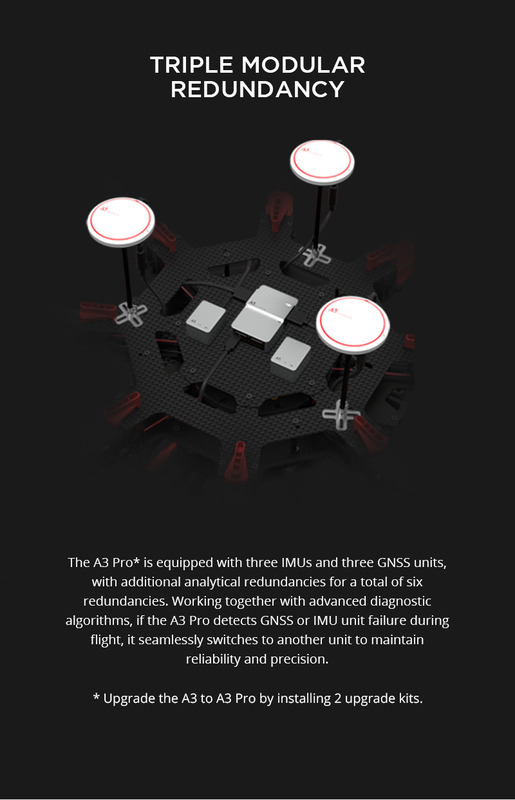 Which gimbals are supported by the A3? 1. What is the iESC port in the A3 flight controller used for? It is used for DJI intelligent ESC communication and upgrade. Currently, it is only used with the DJI M600. 2. 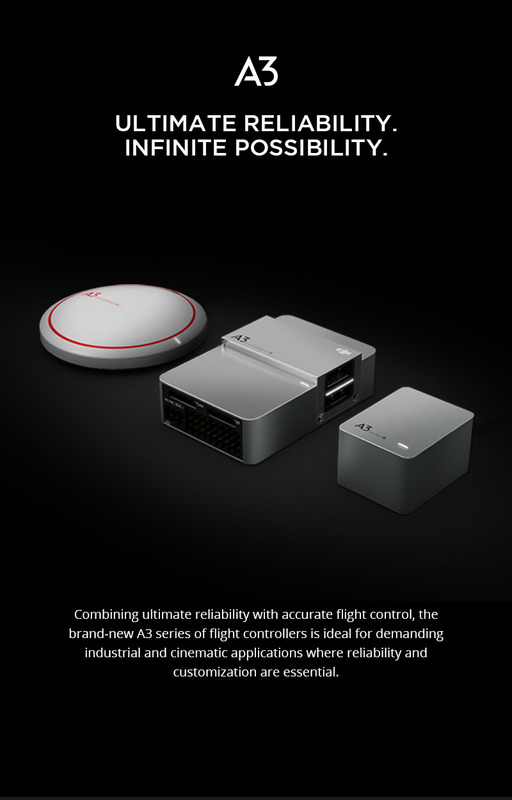 Does the A3 flight controller support the DJI SDK? Yes, it supports both the Mobile SDK and the Onboard SDK. 3. 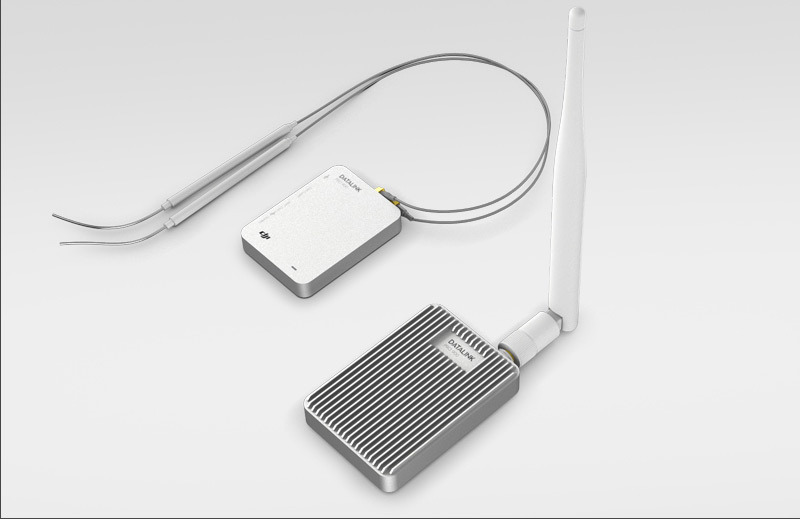 What are the advantages of the RTK GPS kit? 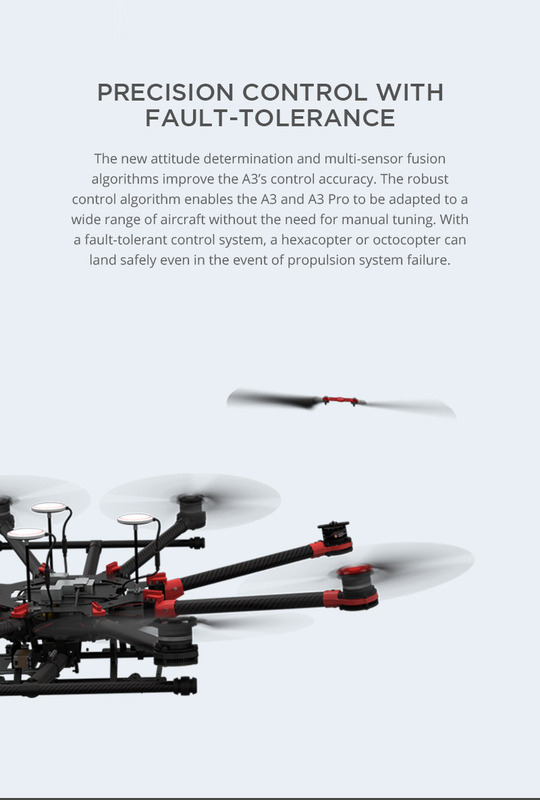 It supports high precision positioning with vertical hovering accuracy up to ±0.02m, horizontal hovering accuracy up to ± 0.02m, magnetic immunity, and high precision navigation information. 4. Can the A3 flight controller work at low temperatures? What is the operating temperature range? It can work properly from -10 °C to 45 °C. 5. What is the A3’s wind resistance when used with the S900? The maximum wind speed resistance is 10 m/s. 6. How does the A3’s triple modular redundancy indicate system abnormalities? The GPS/IMU modules are equipped with LED indicators. Green blinking and blue blinking means the system is working normally, while red blinking indicates anomalies. To check system failures, launch DJI Assistant 2 or the DJI GO app and follow the steps. 7. Why are the LED lights blinking red and yellow? a. If the LED lights continue to blink red and yellow, then recalibrate the compass. b. If the LED lights blink red and yellow alternately and then stop blinking, such as when you bring the aircraft indoors after compass calibration or when the aircraft flies through special areas, you don’t have to recalibrate the compass. 8. How do I determine which IMU and GPS are currently being used? Look at the LED on the IMU and GPS module. If the LED is green, then the module it currently being used. If the LED is blue, then the module is preparing for use. 9. Under what circumstances will the triple modular redundancy switch on? b. If the currently used IMU module is malfunctioning, the system will automatically switch it on to back up the IMU module. c. If the currently used GPS module is abnormal, the system will automatically switch it on to back up the GPS module. LED indicators will quickly blink blue if the switch is successful. 10. Does the A3 have motor fail protection? a. Lift force and quality ratio over 2.5.
b. At least 6 axes. Note: If the aircraft starts spinning after motor fail protection kicks in, the aircraft will automatically switch to Course Lock mode. 11. Can I use the A3 without GPS?